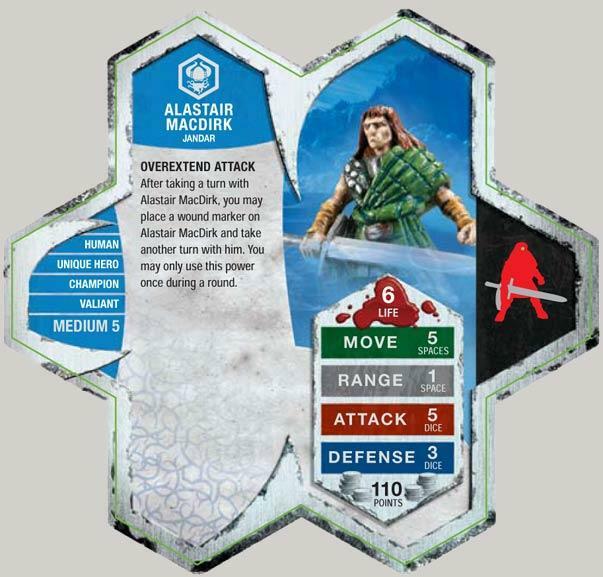 After taking a turn with Alastair MacDirk, you may place a wound marker on Alastair MacDirk and take another turn with him. You may only use this power once during a round. Can you place the 6th wound marker on Alastair & take your last turn according to Overextend Attack? As a Human Champion, Alastair MacDirk may benefit from Knights of Weston and Mac Dirk Warriors HUMAN CHAMPION BONDING activation bonus. Having a Valiant personality, Alastair MacDirk may aid the 4th Massachusetts Line with their VALIANT ARMY DEFENSE BONUS. As a Human who follows Jandar, Alastair Macdirk may aid Sir Orrick with his A BROTHER'S CALL movement bonus. As a Human who follows Jandar, Alastair Macdirk may benefit from Capt. John Varan's PURPLE HEART wound reassignment. As a Unique Human, a destroyed Ebon Armor you control may be placed on Alastair Macdirk's Army Card to replace Alastair Macdirk upon his own destruction. Drafting Alastair MacDirk without A Squad? "You may only use this power once during a round"
Alistair is great if used right, but can turn nasty, which is why Sonlen is in the army. You can use Kelda, but that could turn even worse. The Knights of Weston and the McDirks are great use with Alistair, making him have three turns in one go. I have to agree that Alastair is awesome. Attack 5 two times in a row at least in the first round! The next round can give you another attack 5 two times in a row! Then move 4 MacDirk warriors with at least attack 3 each during their first turn and at least 4 attack each in the 2nd round (if you still have them all hence the need for two squads at least). The MacDirk warriors go fast, but you could play at least two of those squads and milk Alstair's 6 lives (or better said his first 5). You could also boost the warriors defense and retreat Alastair to a save location even risking a living engagement attack just before he is gone (ie. two lives left). Just make sure that he is not cornered. The possibility of getting up to 7 attack from each warrior can be devastating and they don't even have to be adjacent or within clear sight of Alastair. It's almost like 4 mini Krugs. Alastair is one of the few heroes that will make you smile when he gets wounded early on, but you do want to keep him alive longer when 1 or 2 lives are left in him (even more so than other unique heroes). Afterall, "there can be only one", a direct quote from MacDirk Warriors' card. Or is it Highlander? Last edited by Hero Hot Hatch; June 1st, 2008 at 11:07 AM. I pulled an incredible play with him and two squads of his Scots the other day. My Scots and Alastair held a little ridge and were attacked by my opponent's knights of Weston led by Gilbert. With my height advantage and a little luck, my Scots all survived. The next turn I disengaged Alastair with two knights twice, racked up four wounds, and overextended to propel myself back into the safety of my starting zone. Then my Scots used the next two turns to kill all the KoW, Gilbert, Denrick, and Retiarus. Then use range fillers for 500 or 600. Maybe 10th X 2 for a round 500. After Alastair is wounded retreat him, and substitute him with Thorgrim. After Thorgrim dies, place his spirit on Alastair. It will help him last longer. I've done it twice (the core army not with the 10th yet) and wiped out a whole lot of orcs and marros. Of course, you can always substitute Thorgrim and get Raelin instead, but I like that Thorgrim bonds with the Warriors. In other words, you don't have to worry about order markers on Raelin. Last edited by Hero Hot Hatch; June 18th, 2008 at 08:20 AM. just got him last week, can't wait to play him, but am looking to get a second squad of macdirk warriors before i do. He also plays great with the Knights of Weston! I love Alastair, being of the blood. But get a third squad of MacDirks, if you really want to do the Highland Fling. One solution although it has its obvious negatives is to play a squad of KoWs, while the MacDirks are still weak attack wise. I try to limit my commons to no more than 2 sets, but there is always justification for more sets specially with 4th Mass, etc. With so much diversity available the need for many multiple commons is lesser and lesser. First, it costs more money. Second, there are more choices for more versatile armies now than two years ago. I made one of the few exceptions and bought 3 sets of 10th, but that's it. The other problem with the MacDirks is that if your champion or when your champion goes down (most likely either Alastair or Sir Gilbert), the value of the MacDirks in your army drops by 50%. It's a risky proposition. So far I have played with him twice and made sure I had 2 to 3 squads of MacDirk Warriors to run to the aid of their leader. But both times he has been the victim of an insta-kill. ... and down he went. Leaving the MacDirks alone. The second time I send him out with some KoW to slow the advance of Krug and his arrow gruts. He nearly has Krug killed (6 wounds on 2 attacks). Only to have Grimnak run up and roll a 20 to chomp him. Again leaving the MacDirks to scratch themselves while they get clobbered. Hopefully my luck will change, or my drafting Alastair will have to end. EagleOne, most of us who love and play Alastair don't send him out front at all. Maybe that would help. It certainly would keep him from getting killed instantly. Rev, you're probably right. I'm still getting the feel for a lot of the characters because I've only played about 7 or 8 games against other people. Playing is the key, EagleOne. Keep at it. I spent my college years going from Richmond (home) to Bristol (school). When things got boring, we'd jump in the car and drive north to Roanoke, because, in those days, the bus depot had the best pinball machines in SW Virginia. So, I have a fondness for your locale. I would agree with Rev. If you use that team again, I'd recommend extending with Alastair (just to get a wound or three--but leaving him out of harm's way) and then sending in the MacDirks, perhaps with Thorgrim bonding along the way to boost their defense. If (when?) they eventually fall, you will have a pretty hefty attack in Alastair to clean up any mess still left on the board. Also: what pinball machines were they, out of curiosity?